Rare Guitars Eric Clapton Special Limited Edition Martin D000-28 Eric Clapton Signature Edition Acoustic with Hard Shell Case. 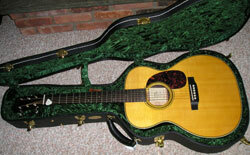 Top: Solid Sitka Spruce. Mahogany Neck. Fingerboard Solid Black Ebony. 14 Fret (Clear) 20 Fret Total. US $ 4250.00 Click Here to see a photo of the item. Rare Guitars Fender Strat Extremely Rare Fender Strat RB Classic Series #6 of 20 Custom Shop Green Guitar with Painted Headstock, Mother of Pearl Inlay Pick Guard with Custom Colored Knobs - Electric US $ 3999.00 Click Here to see a photo of the item. Rare Guitars Gretsch Country Special Ltd. Ed. Reissue w/All Gold Hardware,Gent Reissue Bigsby,Dbl Mutes w/Red Felt,Dbl Cut-Away Model G6-122SP Dual TV Jones Pickups,Walnut Stain,Hollow Body w/Painted "f" Holes,Grover Imperial Tuners,Snap on Back Pad,22 Frets,Thumbnail Inlay Markers Japan $ 3999.00 Click Here to see a photo of the item. 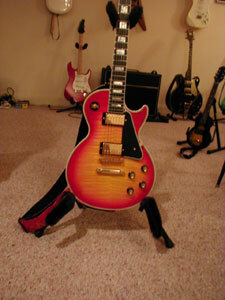 Rare Guitars Les Paul Les Paul Historic 1968 Custom in Sunburst with Incredible Flame, All Gold Hardware in a Hardshell Case US $ 5499.00 Click Here to see a photo of the item. 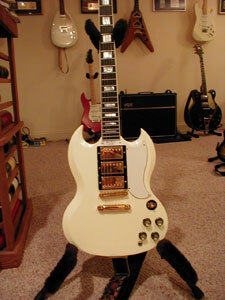 Rare Guitars Les Paul SG Historic 1962 Custom in White with All Gold Hardware, 3 Pickups in a Hardshell Case. The Guitar is from 1999. US $ 4250.00 Click Here to see a photo of the item. Rare Guitars PRS McCarty Double Cutaway with Brazilian Fret Board, Ten Top, 24 Frets, Signed Limited Numbered Edition, Abalone Bird Inlays, Number 395 out of 500 with original hardshell case. US $ 4899.00 Click Here to see a photo of the item. 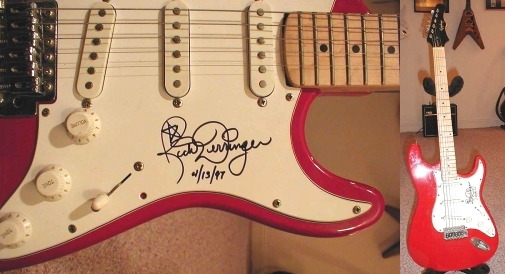 Rare Guitars Rick Derringer Signed On White Pick Guard 4/13/97 Red Gibson Epiphone with 3 Pickups Played Onstage (Broken High E-String) - Electric US $ 750.00 Click Here to see a photo of the item.